At first glance, Target.com may seem like your average bargain shopping site. Upon closer inspection, though, you will find a site full of helpful features, bargains and buying options that set this site above the res. Target.com has a wide range of products that will cover the needs of most everyday families. This bargain shopping site also has some special inventory items and services that are unique to their site. One of the best reasons to shop at Target is their clothing department. 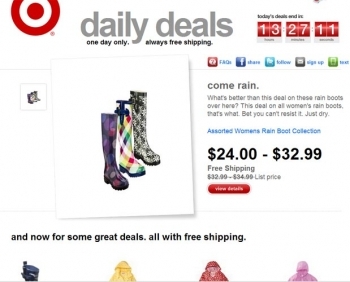 Target is known as the place to go for quality clothing at discount clothing prices. You don’t see many online pharmacies like Target’s, but it is a really easy way to get your medications stress-free. Target.com has many ways to save you money every day. Want more than a weekly deal? Target.com also has Daily Deals that feature items with slashed prices and free shipping. Some of these items are up to 70% off or more. If you want even more deals, check out the Clearance, Deals Under $25, Deals Under $50 and Deals Under $100 sections of the site. These sections are a great place to troll if you need inexpensive gift ideas. The Coupon Savings area of the site has up-to-date coupons that you can print out and take to a brick and mortar Target store. The coupons are for a wide range of items such as beauty products, baby items, food products, soda, pets items, stationary and more. Another problem that customers may have with Target is that they have limited payment options. Unlike sites such as Sam’s Club or Buy.com that offer payment with checks or Bill Me Later, Target.com only takes payment in the form of credit, debit or gift cards. 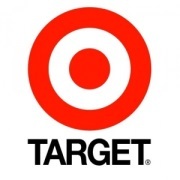 Target.com is the perfect online bargain shopping site for shoppers that want high quality and excellent service at low prices. It has designer brands that can only be found at Target.com, tons of bargains and deals and various store features that are unique to the online store.